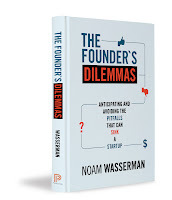 The following is an excerpt from HBS Professor Noam Wasserman’s new book, The Founder's Dilemmas: Anticipating and Avoiding the Pitfalls That Can Sink a Startup. Noam is one of a rare breed of business academics: he studies entrepreneurship using a rigorous empirical approach. The book taps Noam’s analyses of data on 10,000 founders, plus the personal stories of Evan Williams of Twitter, Tim Westergren of Pandora, and two dozen other founders. 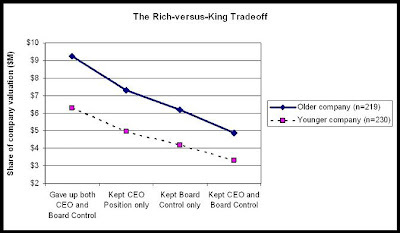 Noam calls this the Rich vs King tradeoff, and it's a remarkable finding. On average, the founders who keep the most control over their company make the least amount of money. As with any data-based result, this raises more questions than it answers. For example, most entrepreneurs know that the most successful entrepreneurs - from Bill Gates to Jeff Bezos - kept tight control over their companies. We therefore seek to emulate their approach, to our own detriment, because we're often emulating the wrong things. Having the real facts helps us ask better questions. We should be asking not "how much control did Bill Gates seek?" but rather "what else is exceptional about his decisions that allowed him to escape the more common fate?" If you're interested in answering questions like this, read on. The following is an exclusive excerpt which sets up a common pitfall regarding equity splits. In Noam’s dataset, 73% of founding teams split equity within a month of founding, a striking number given the big uncertainties early in the life of any startup. The majority of those teams set the equity in stone by failing to allow for future adjustments to equity stakes if there are major changes within the team or the startup. After this excerpt, the book outlines specific solutions that help founders avoid this pitfall. Setting the early equity split in stone is one of the biggest mistakes founders can make. With their confidence in their startup and themselves, their passion for their work and their mission, and their desire not to harm the fragile dynamic within the nascent founding team, cofounders tend to plan for the best that can happen. They assume that their early, high levels of commitment will last long into the future, rather than waning as the challenges of founding begin to sap their passion for the idea and for each other. They assume that no adverse events will change the composition of the team.They also tend to take a very short-term view of the factors that should affect equity splits. They assume that the tasks that they are performing during the early stage of startup development are the same tasks that will be performed during the next and very different stages. They assume that their skills will remain as valuable to the startup as they are right now. They overestimate the amount of value that they will build in the first months compared to the value they hope to build over the subsequent years, and thus overweight their past contributions compared to the future contributions that will be required of them. Each founder places more value on his or her own contributions than on the contributions of the other cofounders,knowing the cost and extent of his or own efforts in a way that he or she cannot know the cost and extent of others’ efforts. But such a best-case approach is hazardous. Uncertainties abound. At the company level, founders learn about the flaws in their initial plans and adjust the startup’s strategy, business plan,and business model. Professor Scott Shane reports that “almost half(49.6 percent) of new firm founders indicated that their business ideas [had] changed between the time they first identified them and the time when they were surveyed about them.” Such adjustments can cause major changes in the obstacles that the startup faces, the skills needed to address those obstacles, and thus the roles that each founder (or perhaps a new founder or a nonfounder) will have to play in building the startup. At the individual level, as the strategy and business model shift,the skills of some founders become more important than the skills of others and roles often shift. As each founder learns about the demands of building a startup, reflects on his or her motivations,and sees how well his or her abilities address the startup’s needs, his or her commitment to the startup may change. The founders also come to understand each other’s abilities and commitment at a far deeper level than was possible at the beginning. Yet founders tend to overestimate how much value they will build during those early days, which can cause even bigger problems when a cofounder’scontributions wane later on. A founder’s personal life may also affect his or her commitment and contributions. At Ockham Technologies, all of the founders were aware of the imminent arrival of idea-person Ken’s first child. However, even Ken was unsure how this would affect his willingness to quit his full-time job and focus on building Ockham.Extreme and unexpected health problems can catch all parties by surprise. For instance, while Microsoft was still a private company, cofounder Paul Allen was diagnosed with Hodgkin’s lymphoma,which caused him to quit the company, leaving Bill Gates as the sole active founder during the crucial three years before it became a public company. In such ways, even the most comfortable equity split can be thrown into disarray. For instance, when Robin Chase and her partner, Antje, founded the car-sharing startup Zipcar, they agreed with a quick handshake to split the equity 50–50. The team believed it had avoided destructive tension over the equity split and could now focus on building the startup. “We shook across the table,50–50,” Robin recalls, “and I thought ‘great.’” Robin had heard about other teams that had faltered because of tough equity-split negotiations, and she breathed a sigh of relief that she and Antjehad avoided such problems. Robin poured her heart and soul into the startup, making major contributions to its growth, and was fully expecting Antje to do the same. Antje, however, remained at her full-time job and, by the summer, was expecting her second child. Robin wondered when her partner would be able to become more involved, but, in the end, Antje never joined full-time. Knowing that Antje still owned the same percentage as she did ate away at Robin, who later reflected, “That was a really stupid handshake, because who knows what skill sets and what milestones and what achievements are going to be valuable as you move ahead. That first handshake caused a huge amount of angst over the next year and a half.” Eventually Antje left the company altogether while continuing as a shareholder. The cost to fix such problems can be very high, ranging from Robin Chase’s “angst” to more tangible financial costs. At govWorks.com, founders Kaleil and Tom had a cofounder, Chieh,who put up $19,000, worked “after hours” for five months (he had kept his day job instead of joining govWorks full-time), and then dropped out. When the remaining cofounders were about to close their first round of financing, their potential funder, Mayfield, was not willing to close until Kaleil and Tom bought Chieh out and reclaimed his equity. The VCs were willing to do a $410,000 “sweetheart deal” to facilitate the buyout. However, Chieh wanted $800,000. Amid the pressure to close the round, Kaleiland Tom ended up settling with Chieh for $700,000, making up the $290,000 out of their own pockets. Kaleil felt he was “beingextorted.” Although the risks of this kind of outcome are real,teams often fail to address them proactively. In my dataset, half of the teams had neglected to include any dynamic elements (vesting, buyout terms, and the like) in their equity agreements, sentencing themselves to the same risks faced by the Zipcar and govWorks.com teams. How should founders deal with such developments? In short, by assuming when they do the initial split that things will change, even if the specific changes cannot be foreseen, and therefore structuring a dynamic equity split rather than the static splits used at Zipcar, govWorks, and many other startups. As important as it is to get the initial equity split right—by matching it as closely as possible thefounders’ past contributions, opportunity costs, future contributions, and motivations—it is equally important to keep it right; that is, to be able to adjust the split as circumstances change. Copyright © 2012 by Princeton University Press. Reprinted by permission.